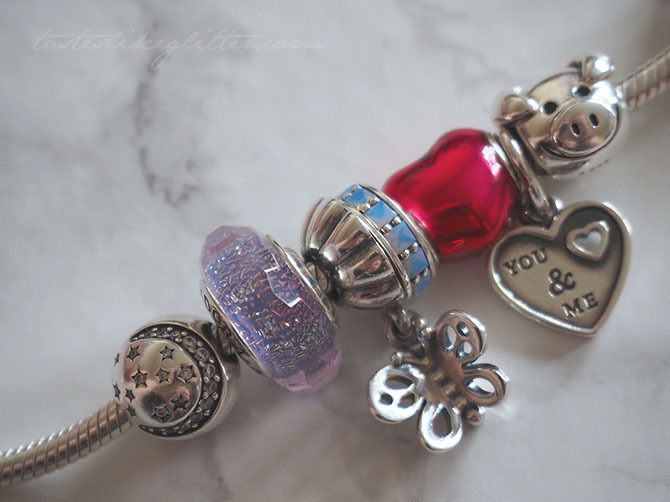 It's not been all that long since my last Pandora post but I wanted to talk about a couple of new charms I've recently got, one of which is from their spring collection. As you would expect their spring collection is full of florals, pinks and lavenders. All finished off with a little sparkle along with some pearlescent finishes. It also brings us some new clips, those being silicone lined. Meaning they can be placed anywhere on a bracelet (including the leather varieties) and won't slide around. Also very handy for the Pandora bangles! Something I've found now that I've really gotten into Pandora is that the photos online don't do the majority of the charms any justice whatsoever. The only charms I've purchased online are the entirely silver ones as I know there won't be much variation with those. The rest I've purchased from my local Pandora store as I prefer seeing them in store. If you can, I highly suggest having a look in person. I hadn't planned on picking this up as I was going to go for a different colour scheme for my bracelet. But the original piece I was going to get wasn't in stock and this was just too pretty to pass up. It's a lovely lilac colour with a crackled foil type effect inside that ends up shining shades of pink when the light hits it. Very hard for the camera to pick up the real beauty. Because each glass bead is hand made no two can be exactly the same. The one the sales assistant picked out for me was just not as sparkly as the one in the display case. She got out four other ones and let me look at each before I decided that the one in the display case appealed most to me. It's reasons like this that I prefer shopping in store and having a good and patient SA that doesn't mind me being fussy over what I want makes the world of difference. I won't go into the details behind buying this charm as it's one of those things that's quite personal to me. But part of the reason I opted for this was that it came in two pieces, which can either be shared or worn together. That and I was looking for a butterfly charm to gift to the person who received the other piece. 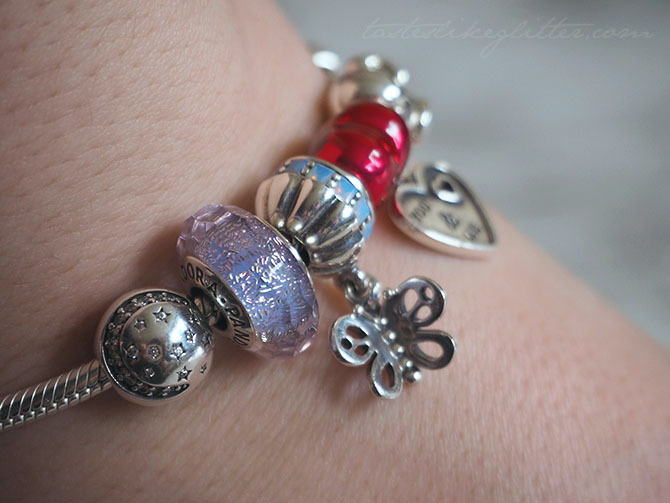 Each having a part of this charm makes it all the more meaningful. The butterfly features a beaded body with two small antennas. The wings feature a cut out design that is the same for both parts of the charm and gives it a little something extra. The inside of the charm has the words 'friends forever' engraved into it. As the surface of this charm is flat I found it looked and sat best against a spacer. The pendant doesn't get in the way and mostly stays where it's supposed to. Overall I think this charm is really great value as you're effectively getting two.